Welcome to the Mammoth Cave National Park Information Page. Mammoth Cave National Park is located central Kentucky, about 35 miles northeast of Bowling Green, KY and about 90 miles southwest of Louisville, KY and about 90 miles northeast on Nashville, TN. The closest major airports are Louisville, KY and Nashville, TN and there is a smaller airport in Bowling Green, KY.
1. Take I-65 South to Stateroad 70 West to the park. 2. Take I-75 South to I-64 West to Highway 127 South to the Blue Grass Parkway West to I-65 South to Stateroad 70 West to the park. 1. Take I-64 West to Highway 60 West to the Blue Grass Parkway West to I-65 South to Stateroad 70 West to the park. 2. Take I-64 West to Highway 127 South to the Blue Grass Parkway West to I-65 South to Stateroad 70 West to the park. 1. Take I-65 North to Stateroad 70 West to the park. 1. Take I-70 East to I-64 East to I-65 South to Stateroad 70 West to the park. 2. Take I-40 East to I-65 North to Stateroad 70 West to the park. Mammoth Cave is easily accessible by: Interstate I-65, Highway 31 West, and Highway 31 East from the north. From the east via Bluegrass Parkway, Cumberland Parkway and Highway 68. From the south, Interstate I-65, Highway 31 West and Highway 68. From the west via Highway 231, William H. Natcher Parkway and Western Kentucky Parkway. All connect with Kentucky Stateroad 70 and Kentucky Stateroad 255 to the park. Bus: Southeastern Greyhound Bus stops in Cave City. Taxi service is available from the bus station to the park, approximately 11 miles. 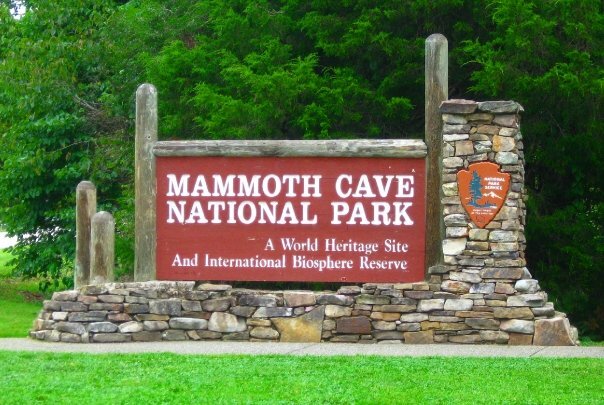 Mammoth Cave National Park was authorized as a national park in 1926 and was fully established 01 July 1941. It was established to preserve the cave system, the scenic river valleys of the Green and Nolin rivers, and a section of the hilly country of south central Kentucky. This is the longest recorded cave system in the world, with more than 348 miles explored and mapped. Mammoth Cave was designated as a World Heritage Site in 1981, and as an International Biosphere Reserve in 1990. Mammoth Cave National Park has 52,830 acres. Mammoth Cave National Park is opened year round with the highest visitation in June, July, and August and the lowest in January. Mammoth Cave National Park is open every day except Christmas Day. Beneath the surface of south central Kentucky lies a world that is virtually unparalleled. It is a labyrinth characterized by mile upon mile of dark, seemingly endless passageways. The geological process resulting in this world that we refer to as Mammoth Cave began hundreds of millions of years ago and continues today. A unique combination of circumstances has made Mammoth Cave the longest cave in the world, with more than three hundred and thirty five miles of mapped passages. First, the karst setting has a large area for potential cave formation. The upstream headwaters of Mammoth Cave are out under the sinkhole plain. Most of the passages large enough for people to enter are under the escarpment, the plateau, and the flat-topped ridges with their intervening valleys. Springs along the Green River are the downstream outlets of ground rivers such as Echo and Roaring Rivers. Second, the Green River valley has deepened slowly due to many interruptions during the ice ages (Pleistocene). As a result, major passages were formed and Mammoth Cave contains multiple levels. Third, the limestone is made up of many different layers with different characteristics; therefore as the underground water sought lower and lower levels, each layer provided a different path of flow. The result is numerous small to moderate-sized interconnecting passages and only a few large ones. Mammoth Cave National Park’s 52,700 acres constitute one of the greatest protectors of biological diversity in Kentucky. The surface contains animals typical of an eastern hardwood forest. Larger animals include white-tailed deer, fox, raccoon, opossum, woodchuck, beaver, rabbit and squirrel. Smaller animals, such as bats, mice and chipmunks, also abound. Many reptiles and amphibians find protection in the park too. Birds such as mourning doves, whippoorwills, owls, hawks, woodpeckers, and warblers fly through Mammoth Caves forests. Wild turkeys reintroduced in 1983 are now regularly seen by visitors. Mammoth Cave National Park was established to preserve the cave system, including Mammoth Cave, the scenic river valleys of the Green and Nolin rivers, and a section of south central Kentucky. This is the longest recorded cave system in the world with more than 336 miles explored and mapped. Touring the cave, hiking the forest trails, canoeing, fishing, camping. Combining a cave tour with a surface hike is the best way to get the full picture of this resource. Bicycles are allowed in the park on the park roads. No bicycles, roller-blades or roller skates are permitted on the trails in the park, except for the designated bicycle trail. The bike trail is a mile long gravel trail that connects Loop B of Headquarters Campground with the Carmichael and Violet City Entrance Road. Canoes are available through liveries outside the park. Inquire at the Visitor Center. Boats may be taken in and out of the water at Green River Ferry and Houchins Ferry. Canoes may be taken in and out at Green River, Houchins and Dennison Ferries. There are four campgrounds in Mammoth Cave National Park. They are: Dennison Ferry, Headquarters Campground, Houchins Ferry camping area, and Maple Springs Campground. Over 30 miles of the Green and Nolin Rivers trace through the park and offer a wealth of recreational opportunities. Angle for muskellunge, bluegill, catfish, bass, perch, crappie, and other game fish. The park concessioner operates food service and a camp store. There are 70+ miles of trail on the North Side. Hike here and you may not see another living soul. Seek solitude in the rugged hills and deep valleys, camp by river, lake or waterfall, explore bluffs and ridgetops. Sixty miles of trails north of the Green River (all except Ganter Cave Trail) are open for horseback riding. Pets must be on a leash and under physical restraint at all times. Do not leave pets unattended at your campsite. There is also kennels at the Mammoth Cave Hotel. The temperature in the cave is approximately 54° Fahrenheit. A light jacket or sweatshirt is recommended. Below ground temperatures stays more or less 54° F. The cave temperatures can fluctuate as much as 6° either way in the passageways close to the surface. Entrances may be very cold. The lower passageways are more constant. Summers are hot and sultry with highs in the 80s to 90s. Winters are mild with highs in the 30s to 40s, although temperatures can drop well below zero.